Who are these men? They look scary! They are scary. Well, one of them is. 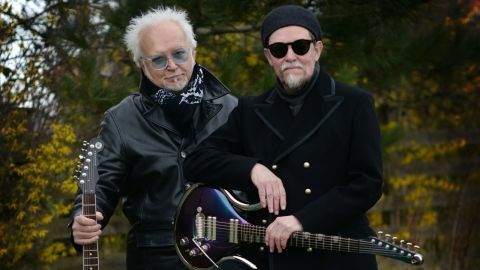 Reeves Gabrels used to be David Bowie’s guitarist and Bowie is well known for his fondness for men who can bring terror and excitement to records with just six strings. His work even made Tin Machine sound thrilling on a good day. Bill Nelson is less frightening but his CV should induce awe, from his extraordinary work as a post glam stadium icon with Be Bop De Luxe in the 70s to his XTC-style electro rock as Red Noise and his later solo work with ambience, synths and moodiness. So why are they together? Gabrels, like any sensible guitarist, is a long term admirer of Nelson’s playing, and Nelson presumably feels the same way. Their friendship is ongoing but any chance of collaborating was until recently kiboshed by geography. But these days Gabrels plays with The Cure, whose touring schedule apparently enables Nelson and Gabrels to meet up, often near Leeds, and sit down and record together. And is this a collection of Bowiesque rocks and ambient noodle-oo? Not all. Both men play the guitar in a manner best described as “incandescent”, in the way your hands will be incandescent if you pour napalm on them and apply a lit match. There’s little or no room here for quiet contemplation, or even loud contemplation. instead of creating a series of instrumentals or Fripp and Eno style meditative pieces, Gabrels and Nelson have opted for a series of explosions and excitements. That sounds nice. What does it actually sound like? A firework display. Clumps of notes and riffs constantly burst out of the tracks and the music keeps exploring odd but colourful side tracks like a psychedelic bloodhound. There’s not much in the way of tunes you can whistle but lots of moments where you might feel you’re being attacked by a Jackson Pollock painting. The two of them have clearly got a lot of ideas they want to express and are taking great pains to express as many of them in as short a time as possible, as dramatically as they can. Why not? The results are always entertaining and often spectacular; this may be a side project, but it’s more interesting than a lot of people’s day jobs. There isn’t a hit single here, admittedly (despite great titles like A Brilliant Night For Rain, Infernal Apparatus and And The Train Left The Station Trailing Sparks And Stars) but Fantastic Guitars is clearly an album that’s enjoying itself. Fantastic Guitars is available from Bill Nelson’s website.